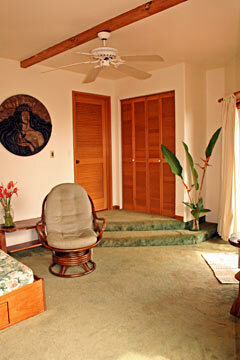 The spacious lower apartment floor plan offers room to relax and a secluded atmosphere. 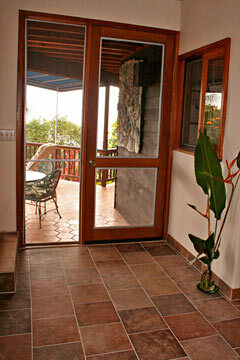 A step away is an inviting walk out into the lovely gardens and ocean views. The private lanai is furnished with comfort and convenience in mind, offering a quiet respite from the pressures of everyday life. A fully appointed kitchen graces the lower apartment. Enjoy preparing meals and snacks in the roomy kitchen, designed with liberal use of warm tropical woods, and ample storage. Relax with a soothing bath, or a shower massage jet. 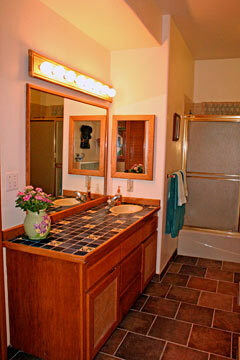 Guests appreciate the convenience as they get ready for a night on the town. 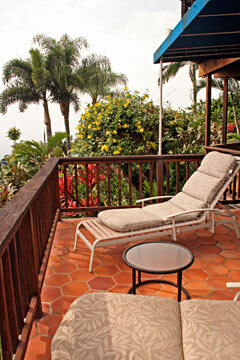 This apartment has two double beds, which sleeps up to 4 people, a separate entrance, tile bathtub and shower, living room, kitchen, and outside dining and sunning lanai with spectacular views of the botanical gardens and the ocean. 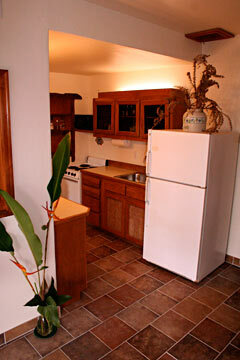 The kitchen features a refrigerator, oven, microwave, sink, and disposal as well as full sets of dishes and kitchenware. 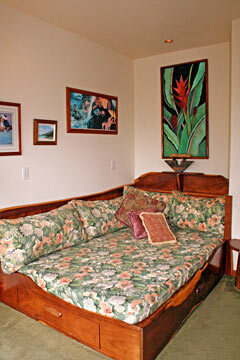 The unit is furnished with priceless Koa "art furniture" and decorated with works from some of Hawaii's most famous artists. 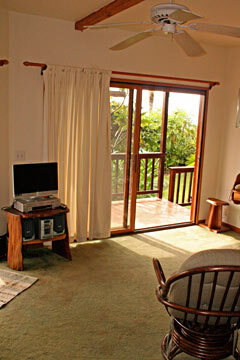 All in all, the lower apartment unit offers convenience, privacy and relaxed tropical environment, perfect for a family vacation, a honeymoon retreat or just a weekend getaway. 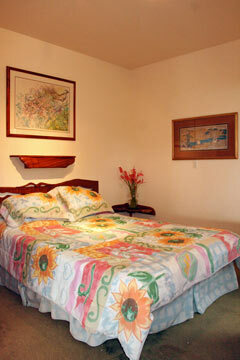 The lower apartment has two sleeping areas, each with a queen size bed, which is suitable for two couples. 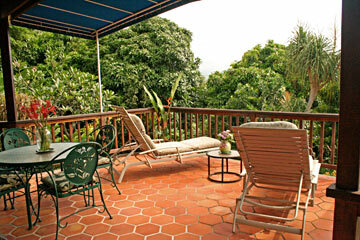 The cost for this unit is $135.00 per night for double occupancy, plus tax and cleaning fee. Go to the Reservations page for full details.